Automatic (self-winding) watches were introduced by Hamilton in 1954. Over the next few years more and more automatic models were introduced. Many would feature some of the really futuristic designs inspired by the world's fascination with space exploration. A great example is Hamilton's Automatic K-454, which became known as the "Sputnik". It was introduced in 1955 and produced for three years. The Sputnik was a satellite launched by the Soviet Union in 1957. It was a low Earth orbit satellite and visible from Earth as it passed overhead. It had long antennae that radiated from it's spherical center. 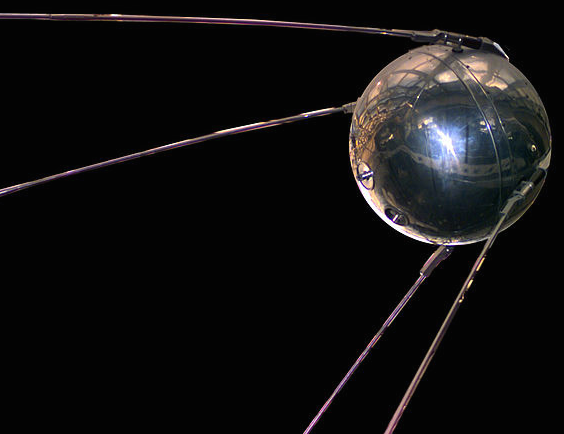 The Sputnik created a space crisis that inspired an urgency to the lagging US space program. The K-454 came in a yellow gold filled case with a stainless steel back. The silver dial features solid 18K gold markers with luminous centers with flush gold markers that radiate from the center of the watch and align with the lugs on the case. Under the dial is a 17 jewel Swiss-made Hamilton 661 movement. I recently rejuvenated an aging Sputnik in need of some tender loving care. As received, it was in fair overall shape. The dial was quite dirty and the crystal was in need of replacement. Scratches on an acrylic crystal can usually be buffed out but cracks cannot. Cleaning dials is something that needs to be done with extreme care. This K-454 has an original dial so keeping it original is important. Knowing when to stop cleaning is something that comes with experience. Once you ruin a few dials by removing the printing on the dial you develop a feel for when to stop. As a result, some dials will only get so clean - but any blemishes left can be considered part of the watch's character. 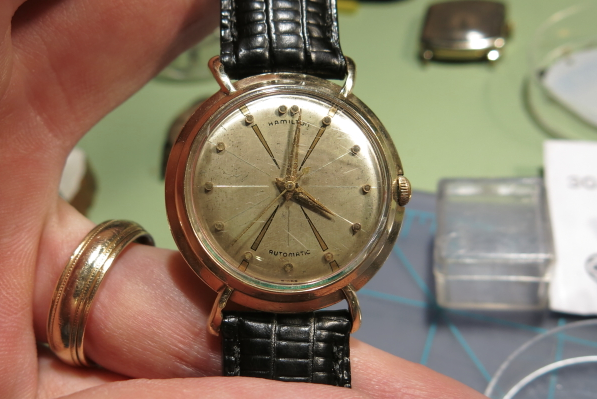 An overhaul of the movement and replacing the crystal completed the restoration. I think this Sputnik turned out very well. Do you have the production numbers of the K-454 for each year, and which serial numbers were in each year's production? Also, what was the original band/strap for this watch? Thank you. No I don't have production info for the K454. Being made for three years, the 454 isn't really a rare watch but it is a cool looking watch and is thus very collectible. The original bracelet was made by Kreisler. I have no idea what the original strap would have been - other than something branded by Hamilton. Croc-grain straps were common during this period though. Would you happen to know what type of box this watch originally came in? No, not really. Probably a clam shell style and it would have said "Automatic" in the interior. I've seen different versions though and I can't really say when they were used specifically. 1955 could have been the end of the "old style" or the beginning of the "new style". It's curious that this watch is referred to as the "Sputnik". This timepiece was introduced in 1955 while the Russian space satellite was launched two years later. Yes - luminous hands and dots on the hour markers. I've noticed that many of the models that you work on are uncommon, such as, this Sputnik. Where do you find these rare and hard to find models? Same places everyone else does... eBay or elsewhere. The Sputnik isn't especially rare but it is especially popular so people tend to hang on to them. You'll see them come up for sale several times over a year but they usually sell for good money. What kind of price range have you seen the Sputnik go for lately? I don't follow prices too closely but $500, give or take, is directionally correct. Less if it's not in good shape, in need to work, etc. and more if it's especially nice. 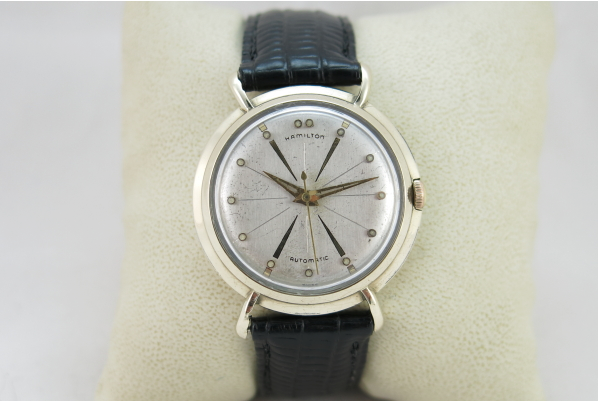 You say that this watch "became known as the "Sputnik". What does that mean exactly? It means that this uniquely designed model is referred to by collectors as the Sputnik, as inspired by the Soviet satellite from the same period. Thanks...so Hamilton had nothing to do with naming this watch the "Sputnik"? I think some collectors may be confused on that issue. Nope, it's a nickname as far as I know.